MDEC International has been incorporated in Maryland (USA) since 1990 . The entrepreneurial & innovative skills of MDEC engineers & programmers are behind the success and accomplishments of the company. MDEC engineers have a proven track record of creating and successfully developing new technologies and innovative technical solutions cost-effectively. For nearly 25 years, these technologies have been deployed by global organizations, such as NASA, 3M and Honeywell, as well as by MDEC for its own customers. MDEC technical solutions cover a broad spectrum of scientific, business and consumer applications. Some of our achievements are described below. Historically, almost everybody in the world (with the exception of large corporations with Mission Critical applications) is used to two basic data backup systems, namely, Manual Backup and Scheduled Backup performed either daily or weekly. And everybody thinks these are the only two ways to backup their data. The fact is... these backup systems are used around the world because of the non-availability of cost-effective technologies. The major drawback of manual backup system is the busy life of today's computer users. They don't have time to stop doing their work, backup the data after every file they create/modify, and then continue. And in many cases, they simply forget about backing up their data. The primary drawback of scheduled backup system is that if the computer crashes just before the scheduled time, you lose the entire day's data. As the name suggests itself, MDEC International has developed a unique technology for the Real Time auto Backup (RTB) software that is affordable for everyone around the world. The RTB application continuously monitors all files in your computer. As soon as a file is created or modified, it automatically backs up the file on a USB drive, another computer on your LAN (Local Area Network), a computer in your remote office, or in MDEC Data Center . The user never has to worry about losing his valuable data . During last decade, continually rising costs of the healthcare industry have affected everybody in the country. The malpractice insurance premiums have skyrocketed, while the payments to physicians by insurance companies have continually declined. The health insurance premiums of patients have been rising steadily. The costs of prescription drugs are increasing every year. Every HC service provider (physicians, hospitals, nursing homes, diagnostic labs etc.) is a victim of the rising costs. But it is the patient who is suffering from the rising costs and deteriorating quality of services. The primary cause of the high cost of healthcare in the U.S. (and many other countries) is the creation, storage and exchange of patient health information using paper and pen . These in-efficient processes have resulted in overhead costs of 50% to the U.S. healthcare industry. For every dollar spent on patient healthcare, 50 cents are spent on overhead tasks. Currently, the overhead administration cost of US healthcare industry is more than $23 billion per year. As the healthcare costs are increasing, the quality of services to the patients is deteriorating. P2P Network... finally a Solution for Cost-Quality Problem! The P2P Network patented technology (US patent no. 7,613,620) has made it possible for MDEC International to offer IT systems to physicians and other healthcare service providers that are affordable, reduce the overhead costs of providers, improve the quality of services to patients, and reduce patient frustrations. The P2P technology has made it possible for MDEC International to eliminate the root causes of a number of problems contributing to the high cost of healthcare industry. The P2P has enabled MDEC to offer technical & business solutions to physicians, HC service providers and product manufacturers at a significantly lower cost. It has also enabled MDEC to help improve the quality of HC services and reduce patient frustrations. MDEC has accomplished this goal, primarily, by automating a number of overhead functions that are currently performed manually in medical offices using paper, fax and telephone. For certain functions that will be automated in the near future, MDEC offers low cost out-sourced services to the HC service providers to further reduce their overhead costs. During last 10 years, MDEC International has developed a number of custom software applications and websites for its customers around the globe. A Web/Client-Server application for Pedigree co. serving as a nationwide portal for company customers in India. Pet-Soft Software for practicing veterinary physicians. MLM Software for a Multi Level Marketing company. In 1994, as the Internet began to gain popularity, MDEC engineers envisioned its global growth and the impact on IT industry. They predicted that, along with the Internet, the need for high performance computers & data storage would grow exponentially. Since MDEC had past in-depth experience in the design & development of Microprocessor based systems, MDEC partnered with Digital Equipment Corp. ( DEC, now Compaq/HP) and became an OEM for DEC's Alpha product line. Between 1996 and 2001, MDEC developed and sold a comprehensive product-line of world's fastest Servers, RAID Storage systems, and Workstations. MDEC also offers Network Design & Installation services to its customer in the US . The Dept. of Commerce in Washington DC (US Federal Government) was one of the earliest customers of MDEC for Alpha products. We carefully selected and hired a team of Engineers, programmers and technicians for this project. Hiring the right people for every task, motivating them to be creative, work hard and do their best was the key to success. The project was completed on time and within the budget. GRIS electronics worked without failure for 12+ years, proving the quality work done by MDEC International . NASA designed and built its 1 billion dollar satellite - Cosmic Background Explorer (COBE) to verify Einstein's Big-Bang theory for the birth of the universe. For this historic satellite, MDEC engineers assisted NASA to find solutions for many technical challenges. Measurement of the deep space temperature (2 to 4 degree Kelvin); managing design, fabrication, and testing of the spacecraft Power System Controller were just a few of those challenges. 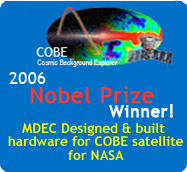 For a number of years, MDEC engineers assisted NASA as contractors in many hardware and software projects for Space Shuttle and other satellites. To design a digital instrument capable of superimposing data streams (such as weather report, football scores etc) on a live (analog) TV broadcast channel. The limitation was the availability of powerful microprocessors, since Intel's 8-bit 8085 chip was the most powerful CPU available in the market (in 1983), running at a maximum speed of 10 MHz. MDEC's co-founder created a parallel processing technique to use three 8085 CPUs for the design of the digital instrument. To measure and control the Relative Humidity of an enclosed environment with an accuracy of +1%. The only commercially available Microprocessor was Intel's 8-bit 8080 (in 1979), with no floating point arithmetic capabilities. Traditional methods and standard software practices would require addition of a memory card, driving the cost of industrial Humidity Controller very high. MDEC's co-founder solved the problem (and received an award ) by analyzing the properties of earth's atmosphere, creating an innovative mathematical solution, and developing the software using Assembly Language programming. Not having to add additional memory board in each controller saved thousands of dollars over the life-cycle of the product line . NASA needed to conduct a study about the flight behavior of pilots. They wanted to continually monitor and record the look-point of the pilot during a test flight. The problem was to determine his exact point-of-focus on the instrument panel at any given instant. Due to practical restrictions, the aircraft cockpit had to be dark, and nothing (such as eye-glasses) could be attached to pilot's eyes & head. MDEC's co-founder (in 1977) solved the problem by creating an innovative technical solution, reducing it to a set of mathematical equations & algorithms, and developing software using FORTRAN language.